Above: Neil Kelly's North Portland Headquarters, 1997. In 1947, Neil B. Kelly started a remodeling company with a $100 investment and a commitment to quality, value and client satisfaction. During the next four decades, he built it into a nationally recognized business with a reputation for award-winning design, innovative practices, outstanding craftsmanship and community engagement. Now, after 70 years, we’re still inspired by Neil’s vision, values and innovative spirit, and we continue to carefully craft our reputation one project — and one satisfied client — at a time. We’re honored to share seven decades of company milestones and triumphs. 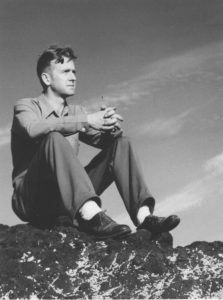 1947 — Neil Kelly purchases Northwest Weather Proofing as a $100 investment. He ran the business out of the basement of the Northeast Portland home he shared with his wife, Arlene Kelly. Eventually they rented a storage garage across the street from their home. 1950s — The company expands its business from working on foundations, footings and driveways, to becoming a full service, general remodeling company. 1962 — The company moves out of its basement location and into a remodeled 1930s gas station at 735 North Alberta Street. 1966 — The company opens its own cabinet company. 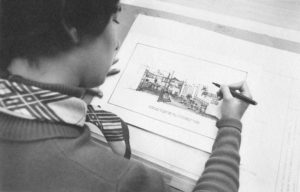 Above: Julia Spence puts the finishing touches on an architectural rendering, circa 1972. 1970s — The company pioneers the design/build remodeling process, and promotes women to roles in sales, design, drafting and carpentry. 1975 — Neil becomes one of the first Certified Kitchen Designers in the United States, and encourages other Neil Kelly designers to seek professional certification. Longtime employee Martha Kerr becomes the first Certified Bath Designer in the country and went on to become the first woman president of the National Kitchen & Bath Association. “My father had an eighth-grade education but he did everything he could to provide his children the opportunity to receive an education, and he passed this onto his employees too,” says Tom. 1976 — The North Portland company moves across the street and into a remodeled showroom and office space at 804 North Alberta Street, where the company is headquartered today. Neil B. Kelly confers on a remodeling project with Tom Kelly, circa 1983. 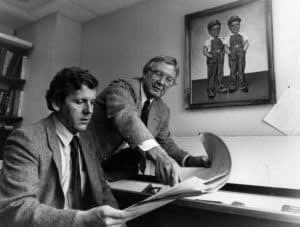 1979 — Tom takes over from his father as president of the Neil Kelly Company. 1980s — The recession impacts the remodeling business, but the company is tenacious and sticks to its core philosophy to do great work and stand behind it. The company implements a team-based system for construction groups and develops a flat organizational hierarchy. During this time, Neil becomes the first president of the National Association of the Remodeling Industry (NARI) and serves as chair of the Portland Development Commission. 1989 — Neil Kelly opens the Beaverton location. 1990s — The company works with Natural Step in an effort to make an environmental and sustainable impact. During this time the cabinet company becomes one of the first to offer FSC Certified woods and formaldehyde-free cabinets. 1995 — The Neil Kelly company begins offering handyman services, allowing the business to service the small project market. Above: Neil Kelly’s Lake Oswego Design Center. 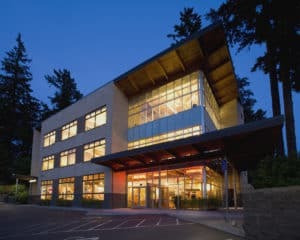 2000 — The Lake Oswego showroom is built as the first LEED certified business building west of the Mississippi and the fourth overall in the country. The Neil Kelly Company is also awarded the National Better Business Bureau Torch Award for Business Ethics in a ceremony at the National Press Club in Washington D.C.
2004 — Neil Kelly opens the Eugene location. 2006 — The company builds the first LEED certified residence in the country. 2007 — The company opens its home performance/energy efficiency/indoor air quality division. 2008 — The company opens the Bend location. 2010 — The company offers its industry-leading five-year warranty. Solar industry services are also introduced. 2011 — Neil Kelly purchases a Seattle remodeler and opens a showroom in 2014. 2013 — The company acquires Mr. Sun Solar, expanding its renewable energy offerings. 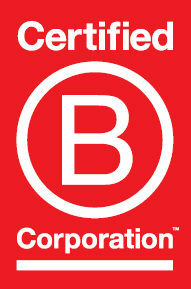 2014 — Neil Kelly is certified as a B Corp, furthering the company’s commitment to social and environmental performance, accountability and transparency. Today — The Neil Kelly Company maintains its commitment to award-winning design, innovative practices, outstanding craftsmanship and community engagement. Discover what the Neil Kelly Company can do for you. We have the skills and expertise to fulfill your vision. Schedule a consultation today.